The Saturday Sampler was a Boot Scootin good time! 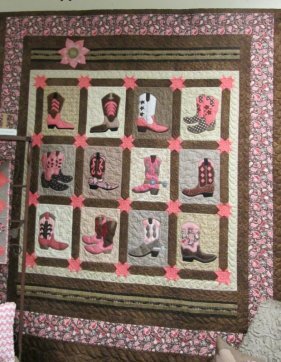 We figured all of you that were not able to come on Saturday would like to see the quilts as soon as you could, so here is YOUR reveal! The Kits are available for both color ways and you can either come into the store and pick them up or you can go to our website www.valleyfabricshop.com to purchase them and we can mail them to you. 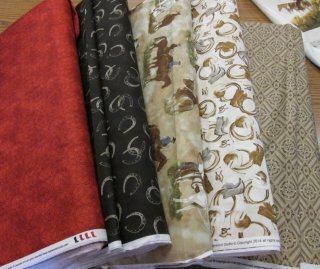 This fabric is just gorgeous! You have got to come take a look at it! 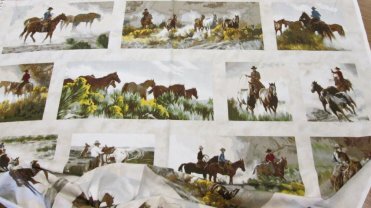 A great pattern to use with the fabric. 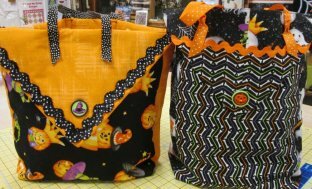 All Halloween Fabric is 30% off this week only (October 13- 18) and come in and see an easy demo on a 20 minute Halloween bag. 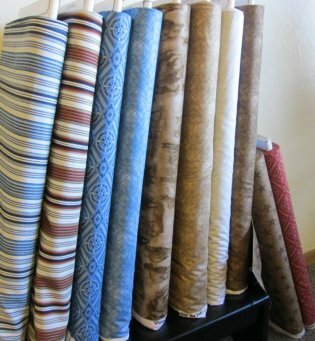 Any Christmas or Halloween fabric purchased after October 1, we will make your pillowcases for free! Pillowcases make great bags to go trick or treating and great to wrap gifts with. You can even embroider a name on them. October is Breast Cancer Awareness Month and we would like each of you to "check your boobies". It is important to have a mammogram after 40 but also to do a self exam each month. Here are our classes for next week. You can either call and reserve your spot or go to our website and pay with your credit card. Reversible Apron- Wednesday October 15 @ 6:00 pm- From Abbey Lane. Make it into two Holiday’s aprons. Halloween on one side – Christmas on the other. Pattern Required. 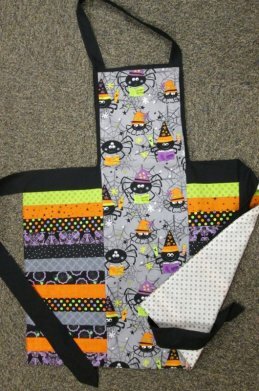 Trick or Treat Table Runner- October 15 @ 6:00 pm- From Art to Heart. You'll want to make a few "monster eye balls" and a mummy chair cover also. All Night Sew- Friday October 17 @ 6:00 pm- Bring your unfinished projects or start a new one while enjoying laughter and friendship. Stay as long as you want and bring a snack to share. 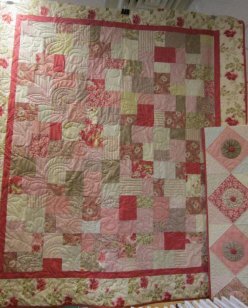 Autumn Lily Quilt­- Wednesday October 22 @ 6:00 pm- Make this beauty from a layer cake and add borders. My Favorite Bag - Saturday October 25 @ 9:00 am- We LOVE this bag. 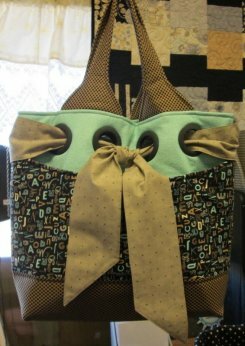 It is great to use as a bag for everything a girls needs and a great diaper bag. A clutch or diaper and wipes case pattern is included. 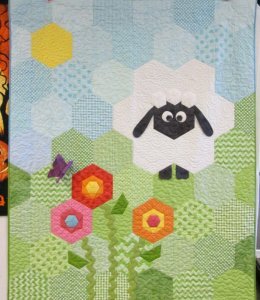 Baby Hexi Quilt- Thursday October 30 @ 6:00 pm- Make this easy baby quilt using half hexi’s. So cute! 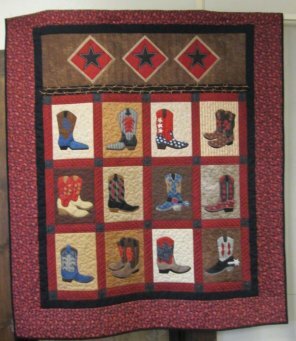 You do not have to make this quilt. You can make a quilt using a layer cake. 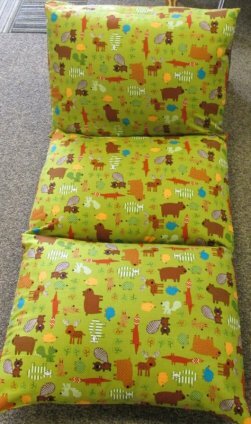 Pillow Bed- Thursday November 6 @ 6:00 pm- Wait till you see these adorable pillow beds. You will want one for all the kids! 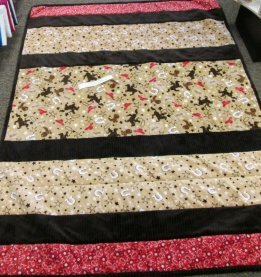 Christmas Tree Skirt- Saturday November 8 @ 10:00 am- Star Medallion- 54 “ x 54”- Made from ½ square triangles, your points should be perfect. 60* Ruler Table Runner- Wednesday November 12 @ 6:00 pm- Quick and simple, you will want to make several of these. Patterns vary – you choose. 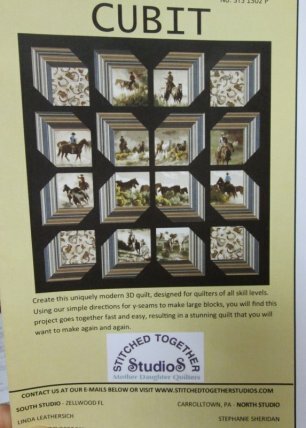 English Paper Piecing- Demo only- Come in and ask most anytime for a demonstration. 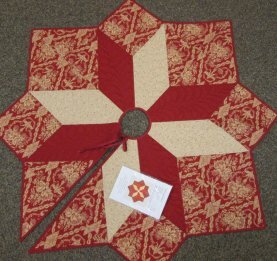 If there is interest in this type of hand piecing- we will get the paper supplies.